Regular readers will know of my love hate relationship with Michael Moore. Something that will make the man himself sit up and think, when you’ve got a Ruffles on your tail it’s got to be a worry. I loved Bowling for Columbine, but thought Stupid White Men was, generally, pish. So it’s one-all with Moore’s latest venture in the cinemas. Moore’s central argument in Fahrenheit 9/11 still makes a lot of sense, America is built on rampant capitalism, capitalism’s central theme is greed, and those who are more successful at being greedy use corporately funded fear and alienation (or more specifically, the fear of being alienated) to maintain their position. I agree with all this, although you could argue that the land of the free, means you are equally free to succeed and fail by any means necessary and it’s just that Bush and his cohorts are better than most at succeeding. Perhaps the true argument should be that the model of the American Dream is fundamentally flawed, for which all Americans must take responsibility – but Moore isn’t brave enough to make that kind of accusation. 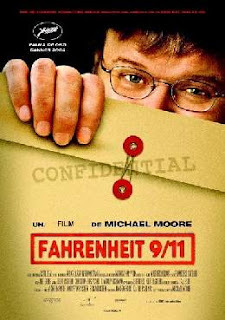 Fahrenheit 9/11 isn’t a great documentary in itself; it’s a bit one paced and his central argument barely develops as the film progresses. Moore’s clearly struggled to get together decent footage to support what he’s saying (either that or his deliberately used grainy TV footage to give it that gritty ‘urban warrior’ feel). His interviewing style is frustratingly leading, expressing his own personal feelings as questions that his hand picked acolytes are happy to agree with. It’s difficult to know what Moore’s objective truly is; this isn’t an intelligent commentary on the state of America and therefore the world post 9/11. If that’s what it’s supposed to be then it will fail to rouse the chattering liberal middle classes. If it’s a wake-up call or call to arms to America’s great unwashed, then the message itself is sound (watching the aggressive recruitment of troops for Iraq in mid-America shopping malls will raise a few eyebrows) but its stylistic execution is unlikely to draw people away from Spiderman 2. If it’s simply a historical social documentary, it’s really quite poor, but if it’s just another voice to add to the anti-republican cause then I suppose it’s sound, if undeserving of the publicity it’s had. So said the text message from Sara, explaining why she was staying over on Saturday night. At midnight, I retired to bed having fallen into a takeaway induced coma. Gareth was on the other end slurring that he was in “A whole world of trouble” – I thought he’d been arrested. He hadn’t as it happens, he’d caved in under intense drinking pressure and decided to make for home. Once in the taxi he either threw up in it, or got the driver to stop so he could. Either way the driver wasn’t prepared to take him any further and kicked him out on the edge of Oxford. Detached from his friends, miles from a taxi rank, freezing to death, he was stranded. We were his only hope a mere 25 miles away. When I eventually reached him he told me the story rather like a tatty flick book which plays out a few pages before jumping to another section then ending abruptly (he was asleep within a mile of me picking him up). At exactly the same time Gareth phoned, Sara’s mobile went off. It was from Waitrose (where she works – it wasn’t extended customer service). Now check this… the temperature in one of the fridges in the shop was going up, so the fridge phoned up a control centre to tell them it wasn’t feeling well. The control centre called Sara – who was on call – to go and sort it out. Sunday: Help two year old niece look for cat, soak people with a hose, jump as 'high as the sky' and, ulp, fall into a pile of stinging nettles. Monday: Fend off questions about delays to re-branding and the building of a new website, check latest 'management metrics' and lose sleep about low bookings for conference. In a rare display of collective philanthropy everyone at work participated in Jeans for Genes Day, a neat idea where you pay £1 to charity to wear your jeans to work. Hell why not? Naturally this caused quite a bit of discussion; from our immaculately tailored saleswoman turning out in her (immaculately tailored) Shakin’ Stevens bleached denim suit, to the big issue of the day was it just jeans, or could was it extended to general civilian garb. One woman asked me whether we could wear trainers (why me, I don’t know) I told her no, she would have to wait for Pumps for Mumps Day.